A house affected by fire needs the intervention of expert teams in order to return to its original condition. There are multiple problems after a fire. Wooden things may be destroyed in the flames, water from firefighters may affect what’s left of the interior and smoke and soot can make it impossible to continue living in that space anymore. Why Smoke and Soot Damage Is So Bad? Smoke is one of the biggest problem because it can infiltrate easily even into the smallest pores of the walls, staining everything and impregnating the air with an unpleasant and toxic odor. Soot and smoke damage is extremely daunting for your health. This is why it is very important to make sure you have cleaned it correctly, without leaving any harmful chemicals behind. Smoke damage may cause a soot layer to get embedded into various furniture items, thus ruining them for good. How Can Olive Hill Fire & Water Help You? 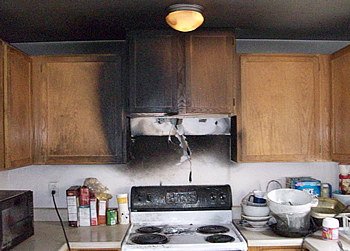 Our technicians are experts in professional smoke and soot damage restoration techniques. They receive intensive training to clean up various types of soot and smoke damage. They can help you restore your furniture, photos, carpets, floors, various household appliances as well as silverware and antiques you may have in your home. We are aware of the importance of all thee items for our clients, therefore we treat them as if they were ours. We can also provide professional smoke and soot cleaning services for floors, walls, ceilings and basements. We have the best materials and tools and the most experienced professionals ready to help you to save your precious belongings. We employ only safe products in our cleaning and restoration services, so that you can return to a perfectly safe home as soon as possible. The cleaning and odor removing products we use are all safe and they don’t harm the fabrics or polished furniture surfaces. By hiring us to help you with your soot and smoke damage restoration, you can be sure you are going to get a professional and compassionate team ready to stand by you and help you make your home suitable for living again. We are available 24/7. All you need to do is contact us in case of emergency. One of our expert technicians will take your call, listen to your story and give you indications on what to do next before the intervention team arrives.